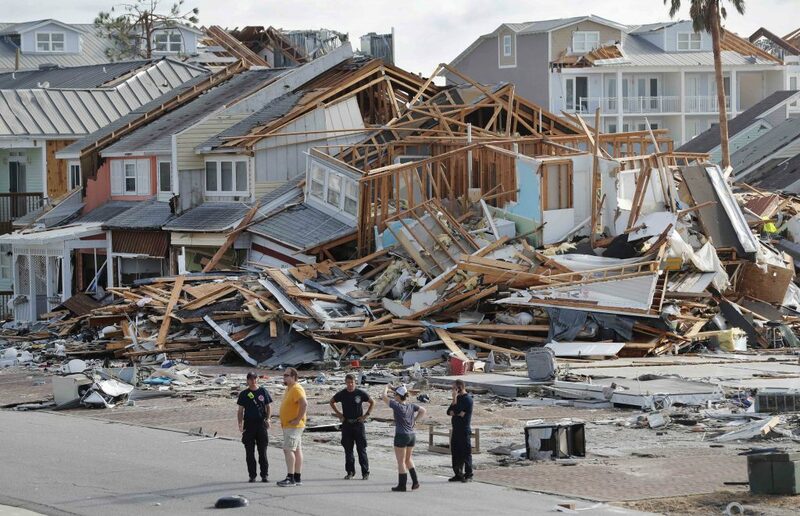 PANAMA CITY, Fla. (AP) — The devastation inflicted by Hurricane Michael came into focus Thursday with rows upon rows of homes found smashed to pieces, and rescue crews began making their way into the stricken areas in hopes of accounting for hundreds of people who may have stayed behind. The full extent of Michael’s fury was only slowly becoming clear, with some of the hardest-hit areas difficult to reach because of roads blocked by debris or water. An 80-mile stretch of Interstate 10, the main east-west route along the Panhandle, was closed. Some of the worst damage was in Mexico Beach, where the hurricane crashed ashore Wednesday as a Category 4 monster with 155 mph winds and a storm surge of nine feet. Video from a drone revealed widespread devastation across the town of about 1,000 people. As the storm made its way inland, it caused havoc in Georgia, spinning off possible tornadoes and taking down power lines and trees. Forecasters said it could drop up to 7 inches of rain over the Carolinas and Virginia before pushing out to sea Thursday night. More than 375,000 people up and down the Gulf Coast were ordered or urged to clear out as Michael closed in. But emergency authorities lamented that many people ignored the warnings.